A dream wedding involves perfection in every aspect. This is where a wedding venue has a crucial role to play –the wrong location can ruin the entire ambience and feel, which is why you have to select a place after careful thought and contemplation. Want to get married in the lap of nature surrounded by beautiful flowers in a garden that looks on to pristine waters? A temporary aisle and arch can be made of wildflowers for the ceremony, while the wedding reception can be held in a makeshift tent with dramatic draping, lights, and carpeting. Not to sound clichéd but at Clearwater Casino, your wish is their command, so whatever you want they will get it done just the way you would like it to be. The cuisine is excellent and has received extremely positive reviews. 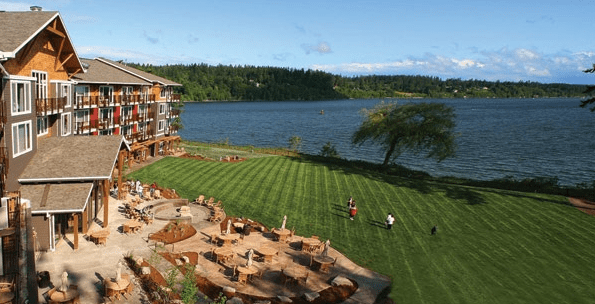 Clearwater Casino has emerged as one of the top wedding locations in Suquamish, Washington, and with good reason since it has an incredibly beautiful backdrop that is ideal for wedding ceremonies and receptions. You can either have a small and intimate ceremony comprising of a few guests or go large. Picking a romantic song for your very first dance as man and wife is a must – a wedding is incomplete without a lovey-dovey number that you can sway to while looking into each others eyes all the time! That is why you need a Suquamish wedding DJ, who can belt out the right tunes at the appropriate places. DJ Scott Fijolek is one of the most famous names out here and the party will rock once he starts belting out magic at the console. He can sense the rhythm of a gathering and play the music accordingly, so the guests get in the mood and rush for the dance floor. Clearwater Casino is one of the best wedding venues in the Suquamish area – the outdoor locales are unmatched through all seasons. Even if the weather lets you down, they have an indoor back-up location ready to go so nothing puts a damper on your special day. There are several places to visit nearby for guests such as shopping in historic Poulsbo, golfing, trying their luck at the casino, and so on.